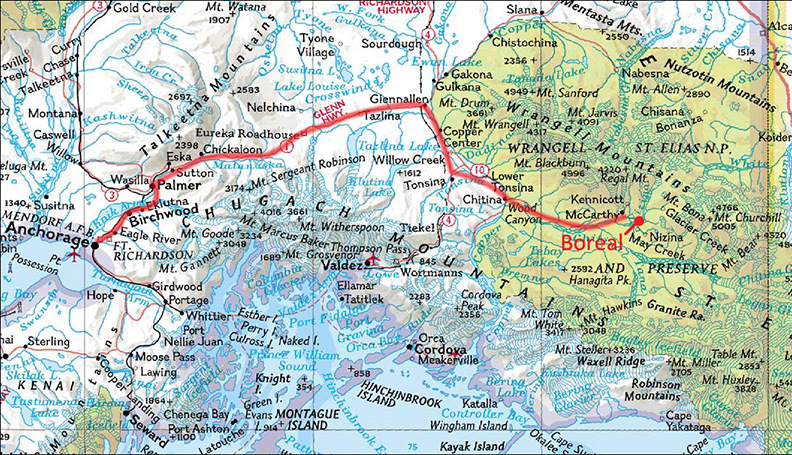 Wrangell St. Elias is in the lower right hand corner of the state, but above the panhandle known as the Inside Passage or Southeast Alaska. The Park is also north and east of Valdez. 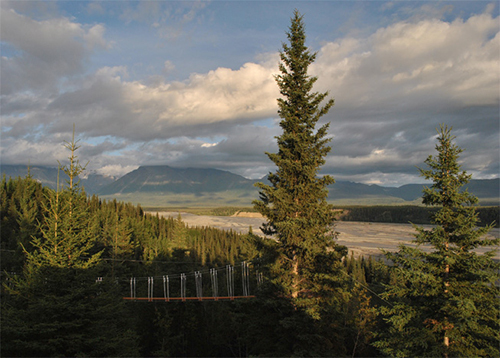 The Park borders the US boundary with Canada’s Kluane National Park, and is about 300 miles east of Anchorage. How can I get to McCarthy & Kennicott? You can either drive or do a combination drive/fly. 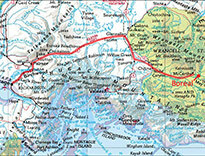 McCarthy is an 8 hour/300 mile (482 km) drive from Anchorage and from Fairbanks 8.5 hrs/370 miles (595 km). If you choose to fly from Chitina you will save the 2 hour+/60 mile (96 km) drive for a 30 minute flight. Contact Wrangell Mountain Air (907-554-4411) in McCarthy for flight schedule between Chitina and McCarthy. Copper Valley Air at Glennallen/Gulkana Airport also provides air service between Anchorage, Glennallen/Gulkana and McCarthy on Mondays and Thursdays. Contact them at 907-822-4200. Tour cost is $195 per person for everyone. What are the weight, height and age limits? Between 70 (31 kg) and 250 pounds (113 kg) maximum. Minimum 5 ft (1.5m) tall. Minimum 10 years old. See Participant Requirements for more information about physical and health qualifications. How long and what is included in the canopy adventure? Total tour time from and returning to McCarthy is about 4 hours. (Shuttles between Kennicott and McCarthy are another 20+ minutes each way and included in the tour price.) Drive time in our multi-passenger Polaris ATVs is about 45+ minutes to our Canopy Welcome Center, each way. 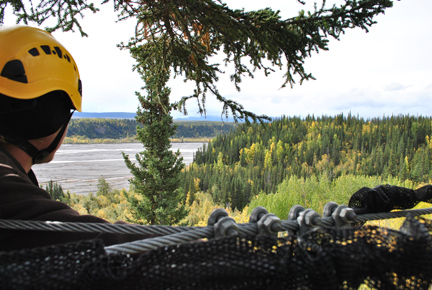 Time on the canopy adventure is about an hour and a half, with additional time to gear up and down, ground school orientation, and a brief tour of our off grid solar power system at the Boreal Alaska EcoLodge. Is weather a factor and what are typical weather conditions? Only lightning and high winds will halt a canopy tour. We operate rain or shine. Typically, during the summer months June thru September, the weather can be a warm and dry 65°-85°F (18°-30°C) or cool and wet 45°-65°F (7°-18°C). Dress or bring gear for both conditions and you should be prepared. 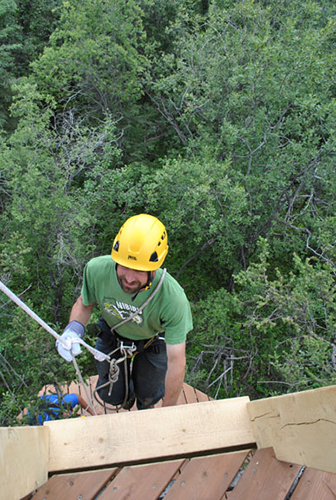 Where is Alaska Boreal Canopy Adventures (ABCA) and where do we meet in McCarthy? 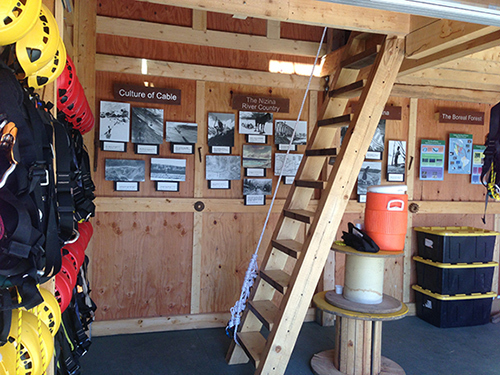 The ABCA Welcome Center and Canopy Course is located 8.5 miles SE of McCarthy on the Nizina River Bluffs. You can’t drive to our remote canopy site, however we provide transportation by our multi-passenger Polaris ATVs. Participants must meet us for 9:00 am or 1:15 pm departures from our McCarthy HQ at the historic Hollywood House. Look for our directional signs in McCarthy and see map. (Download ABCA McCarthy Location Map PDF.) Our Canopy Adventure is about a 45 minute ATV ride (dress warm) from McCarthy. Guests from Kennicott must take the McCarthy & Kennicott Shuttle (included in the tour) about an hour before the McCarthy departure time. Please confirm shuttle time with ABCA a day ahead of your tour at 907-554-1092. See “What if I’m coming from Kennicott?” below, for specifics. It’s not unusual to see wildlife along the 8.5 mile ride to the Canopy Welcome Center. Black and grizzly bear, wolf, coyote, moose, and birds of prey (Great Horned Owls and Rough-Legged Hawks) are occasionally seen on both the road and around the canopy site. What if I’m coming from Kennicott? 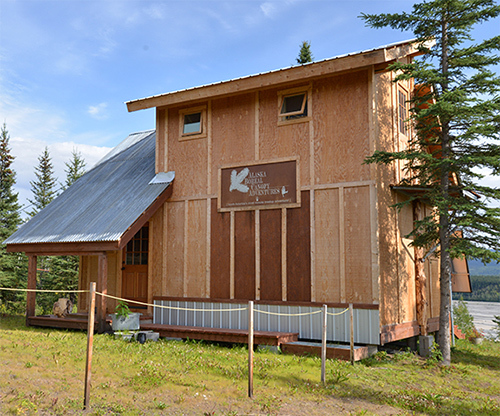 Kennicott guests must ride the Kennicott-McCarthy Shuttle (their Depot is just south of Kennicott Glacier Lodge) to McCarthy at 8:30 am and 12:30 pm respectively, for the McCarthy tour departures at 9:00 am and 1:15 pm. 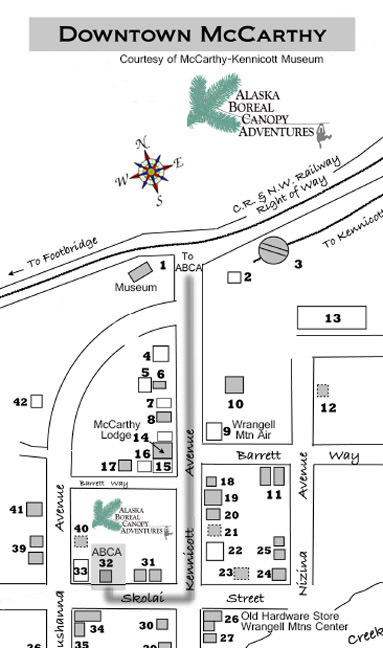 McCarthy tour departures are from our HQ at the historic Hollywood House, a block west of the old Hardware Store (Wrangell Mountains Center). Look for our directional signs in McCarthy and see map. (Download ABCA McCarthy Location Map PDF.) Guests should check in with ABCA a day ahead at 907-554-1092 to confirm their shuttle times. Kennicott shuttles are included in the tour price. 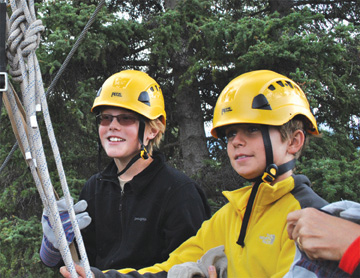 What’s it like on your canopy adventure and how is it different from others in Alaska? 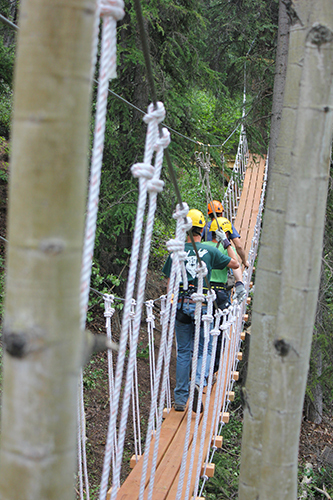 Along the 6 zip lines and 3 sky bridges you may be as high as 60 ft or more (20 m or more) in the trees. Riding a zip line and crossing sky bridges is an exhilarating experience! The views and panoramas of the area and Park wilderness are spectacular. How are we different from other canopy tours? 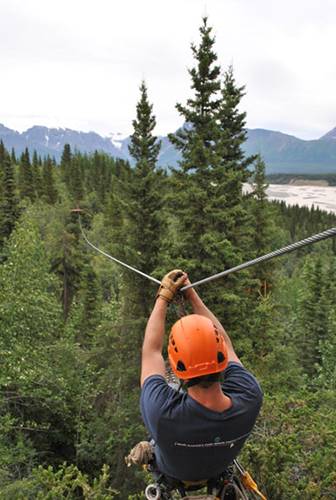 We are “North America’s most remote treetop adventure!” Our location in Wrangell-St. Elias Park is at the end of an 8.5 mile wilderness road where it’s not unusual to see wildlife on the trail. Our canopy course is an exciting adventure where our guides share the history of the Nizina Country and the ecology of the circumpolar boreal forest. Our goal is not only for you to have a great adventure, but learn what makes this a special place. Wear, or bring in a day pack, a fleece jacket and rain gear (jacket & pants, no ponchos). If cool or wet weather, be sure to dress warm and pack a knit cap and gloves for the open air ATV ride. Long pants are preferable to shorts. Wear sturdy closed-toe shoes such as trail/hiking or running shoes. Also, bring a full water bottle. We provide each participant with a complimentary carabiner for clipping the bottle onto your harness. We have water bottles for sale at the Welcome Center. Also, if a child age 10 thru 17 (under 18) is going on a tour without being accompanied by a parent or legal guardian, you must download the Waiver. The child must sign the form and the parent(s) or legal guardian must also sign the indemnification located below the child’s signature. The signed Waiver must be brought to check-in. How is braking accomplished on your course? Like most canopy courses, participants are actively involved and use a simple hand brake procedure. Participants must pass the Ground School where they learn braking, other techniques and guide hand signals. Can I bring a camera? Do you rent GoPros? Yes. Straps, lanyards or clips are important to secure your camera. SLRs should have a shoulder strap. Phone cameras are fine, but manage them carefully so they are not dropped. However, no phone use while on the tour. You may shoot pictures along the Nizina Road, from the tree platforms or in the canopy area. Be prepared to protect your camera from rain, if necessary. We plan to have several GoPros for rent. GoPros fit securely on the front of your helmet and are easily one button operated, and waterproof. Contact us for more information. What is not allowed on the adventure? No tobacco, alcohol or gum use, please. Can spectators go along who don’t want to go on the canopy course? Since we have limited space on our ATVs, spectators are space available only and will be waitlisted. Cost is $100 per person. Your guides appreciate tips and strive to earn them! More than the money, a tip says “a job well done.” Our Guides Tip Jar is located in the Welcome Center. 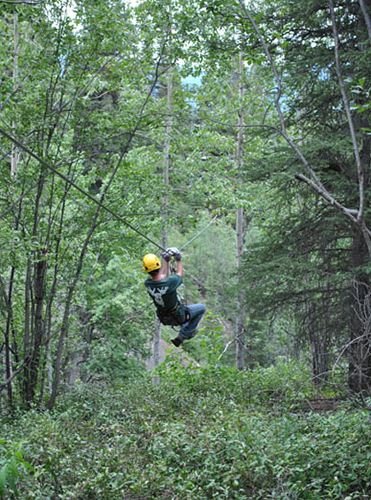 Contact reservations at 907.554.1092 or email info@alaskaborealcanopy.com for group rates for 10 or more.